Hello listeners! Got an extra treat for you this week. 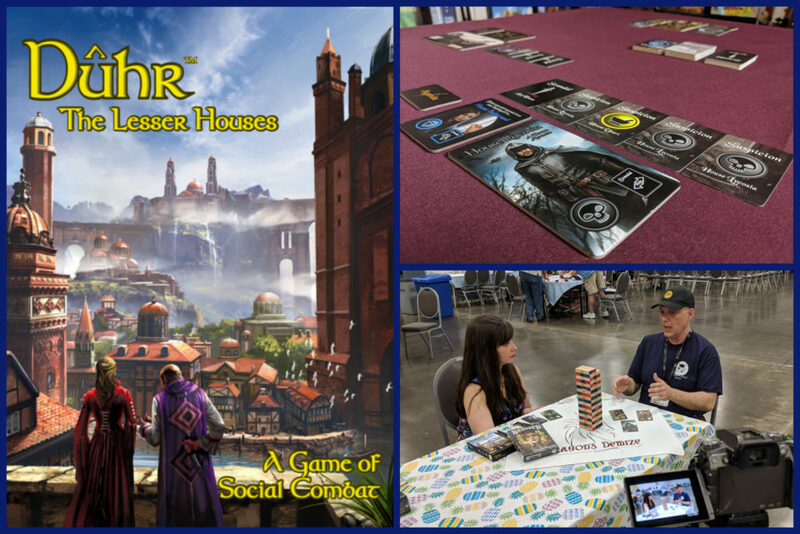 Jim Felli of Devious Weasel Games, who we had a chance to sit down with at Origins this year, is at Gen Con right now celebrating the release of his game Duhr: The Lesser Houses. We thought this would be a perfect opportunity for us to do the same! Duhr is a “social combat” game where 4-6 players duke it out to be the last house standing. Theres’s policical maneuvering, deal-making, backstabbing. Machiaveli would love it. Check out our full review for the rundown. As usual, we also dicuss What We’ve Been Playing Lately. The highlight this week is Palace of Mad King Ludwig, which we though did a great job capturing the feel of the original in the new shared board. Thank you as always to O Abnormal and Agata Poniatowski for the artwork and Strangelette for the music. If you enjoyed this episode and would like to hear more from Dragon’s Demize, you can find us on Facebook, Google+, and Discord. We’re also on Twitter and Instagram if that’s more your speed. Finally, you can find all of our streams, vlogs, and other video content on Youtube or catch us live every Wednesday on Twitch.